Watertown, April 6th, 2019. 11 a.m. or 1 p.m – registration required. Free for all families, everyone is welcome, and the hunt is accessible for children in strollers and wheelchairs. 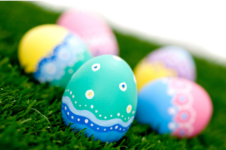 Perkins’ Beeping Egg Hunt is a specialized event for students with visual impairments and their families. Sighted family members are welcome to assist in finding eggs, but are asked to be mindful of the visually impaired participants. All beeping eggs must be returned to Perkins after the hunt. Perkins will also have a photographer present to take pictures during the event. Please see the disclaimer on the page about consent. RSVPs required to https://perkins2.secure.force.com/pmtx/evt__QuickEvent?id=a2d0d000004BXxN or contact Rachel Bennett at Rachel.Bennett@Perkins.org or 617-972-7573.